Organisation: Plenty of balls, Goal, and a area of 20x20. 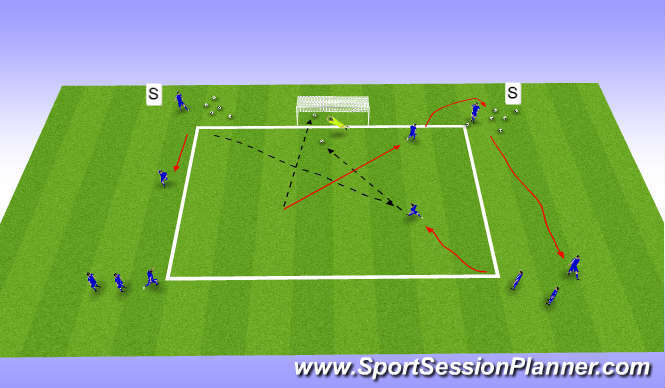 Set 2 servers on the left and right of keepers goal, server 1 passes ball in to player on corner B then makes a run to the back of line A, B collects ball, and strikes at the goal and replaces Server, As soon as ball is dead, Server 2 plays ball in to player on corner A then makes a run to the back of line B, A collects ball, and strikes at the goal and so on...... Progression can include type of ball played in, one touch finish, using other foot. Organisation: Goal, plenty of balls, 2 Areas A and B sized 5x5 with a 5x5 space seperating them. With a 3rd area C sized at 15x10. In area A and B you will have 1 player from each team in either box, these will be your targets, inside box C, you will have a 4v4, after one of teams have made 3 successful passes they can play a through ball to their target, other target has to run around cone placed in area and becomes a defender to try and cut shot out. these two players will be replaced by a player from each team, and will return to play via box C, with the player who was defender bringing a ball into play that are placed by area, and play continues. 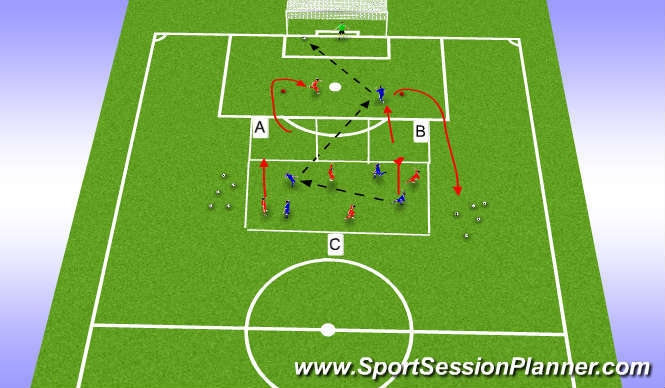 can progress this into one touch finish, letting the player making the final pass move through central box to offer support creating a 2v1. Key Factors: Body Shape/Positioning, Timing/Angle of run, Movement/creating space, Quality of delivery/Finish, Rebounds if needed.